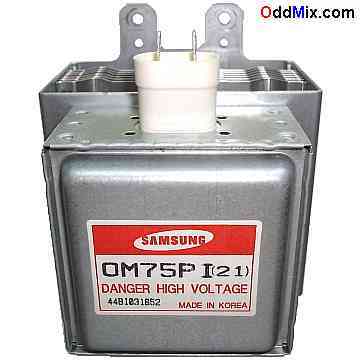 This is a genuine Samsung 2M261, 0M75P I(21) magnetron 1,200 Watts high power microwave oscillator vacuum tube. This is a hard to find and DANGEROUS replacement tube for lower power ovens like some Panasonic NN-774SF the Genius Sensor 1200W models and others. This device is also useable for many other experiments, show-and-tell, for instruments, super high-frequency power amplifier devices and parts source. It has two strong toroid (ring) shaped ceramic magnets. First come first serve one available!